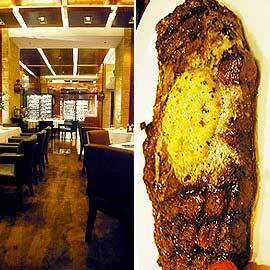 The Hyatt Hotel steakhouse introduces locally-grown premium wagyu beef. 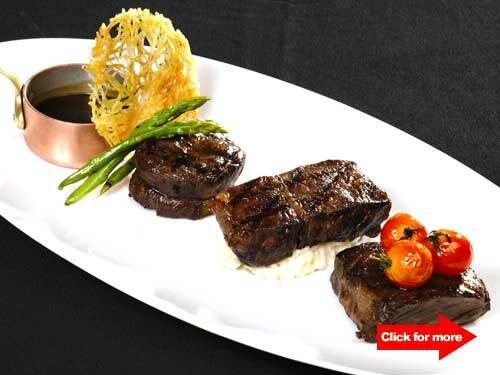 To see Bukidnon Wagyu dishes at The Fireplace, click for more. (SPOT.ph) The Fireplace steakhouse at the Hyatt Hotel and Casino Manila goes local this July and August with native Wagyu dishes by Pinoy Chef Noel Bejasa on the menu. The southern-bred BukidnonWagyu, a product of cross-breeding imported cattle from Australia and the local Brahman cattle, is said to be tastier than its Australian and U.S. counterparts, and promises the same tender meat and nicely marbled cut with a much cheaper price tag. Try the restaurant’s melt-in-your-mouth Steak Tartare (P1,100) for starters and savor thinly sliced Wagyu beef with egg, or the Millionaire’s Salad (P1,400), served with pan-fried foie gras, prawns, seared scallops, organic leaves, and raspberry vinaigrette. Indulge in their tender Striploin (P3,500) topped with herb butter sauce and served with potato wedges. Another must-try entrée is the Peppered Tenderloin Steak (P2,600)-Wagyu beef wrapped in creamy cognac pepper sauce with roasted capsicum and green asparagus. End your meal with The Fireplace Dessert Trio (P340), which includes their sinfully sweet Hot Chocolate Soup, extra creamy New York Cheesecake, and densely-packed Apple Pie. This promo runs until August 31. P-Noy to SONA critics: "<em>May ginagawa kaming tama</em>"